The answer plays out in a very unpredictable and – somewhat appropriately – chaotic manner. Tasked with taking care of the universe from a cluttered office desk, the mostly-unseen, mono-tentacled protagonist of Godly Corp is given a number of different things to do, often simultaneously, in an attempt to prevent an apocalypse. The opening level, for example, sees you in charge of making sure different continents don’t freeze, by spinning the globe until a continent is warmed up by the heat lamp on your desk. At the same time, bugs are attacking and looking to make the Earth their new home, so your tentacle comes in useful in smacking them or – more effective, this, if you can manage it – sweeping them off the desk. Each stage is wildly different from the last, with a variety of tools and tasks to keep your day at the office a busy and challenging one. You’ll be using ray guns, pistols, heating lamps, violins, your tentacle and more; you’ll rarely take on the same jobs twice. Can you keep the world safe under such pressure? The chances are, the answer to that question will be no – at least, not straight away. Right from the start – and even on the easiest difficulty level – Godly Corp is a serious challenge, with your tentacle being a bit unruly and definitely a tough appendage to, ahem, get a grip on (and with!). You’re thrown in at the deep end, with the training level seeing you first have to use your tentacle to lift the cover of the start button, then press the button itself – and, almost immediately following that, the world starts rapidly freezing AND bugs start to make their way across your desk. It sounds – and looks – reasonably simple in practice, but the tentacle alone is a bit of a juggling act with the controls and, adding in the spinning of the globe with further buttons to get the hang of, there’s quite a bit to get used to, very quickly. Perseverance is rewarded, however – though there’s a steep learning curve, the task never feels truly impossible; there’s always the thought that you’ll nail it on the next try. There’s a bit of an issue with the difficulty levels; after the steep challenge of the first stage, the next few levels feel overly easy – and can almost be completed in a way that feels accidental. It doesn’t take long for the game to throw another super-difficult challenge at you, however. Taking place on a single screen with visuals that are slightly underwhelming in their graphical detail, there’s still a lot of clever touches and references (many to Lovecraft and the Cthulhu Mythos) dotted throughout – for example, the ‘I (heart) Cthulhu’ mug on your desk. When starting the game, you’re asked to sign an employment contract which doubles as the difficulty level menu; even these have been written with a somewhat unexpected charm and wit. Though this is becoming something of a cliché among indie games on the Switch, Godly Corp is another that feels utterly unique. Nintendo’s console has become home to an enormous volume of quirky, unusual indie titles – and Godly Corp is no exception to this. 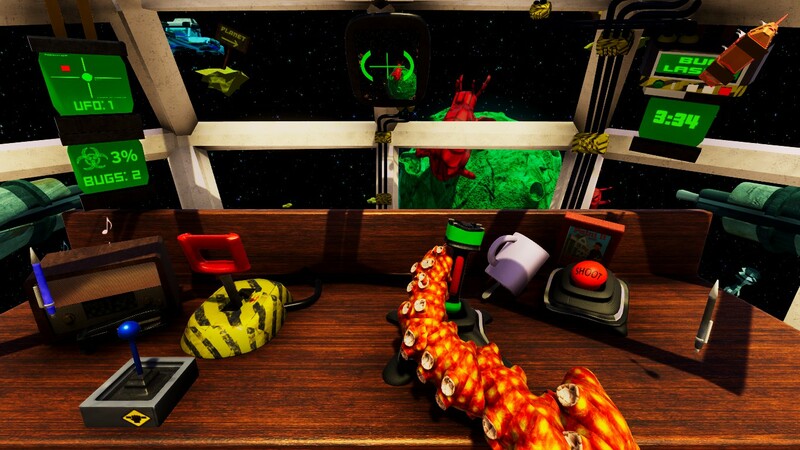 Though it can at times be frustrating to play, much like the aforementioned Octodad, the awkward controls are a deliberately challenging part of the experience. It’s supposed to be jarring and awkward to be in control of a tentacle, after all – not to mention that this is where a lot of the humour comes into play. The skill needed to pass levels – as mentioned above, even the tutorial level puts up quite a fight on the easiest difficulty setting – may be off-putting to some players. Along with this, the victory conditions on some levels – which trigger even when it feels like you haven’t done a particularly good job of juggling your tasks – can make the game unsatisfyingly random to play, but the theme and quirky gameplay, along with the varied tasks on each level, mean that Godly Corp does have a certain charm. It is difficult to recommend unreservedly as it does feel like a bit of an acquired taste – even for a Lovecraft/Cthulhu fan such as myself – but there’s certainly fun and deliberately wry humour here for persistent players.